With a small delay King Seeways departed to Newcastle. Princess moved to another quay. DFDS Princess Seaways has more works to do. She left IJmuiden heading to Poland (Gdansk), according tot AIS. ETA Thursday 21th januar 06:00 hrs. 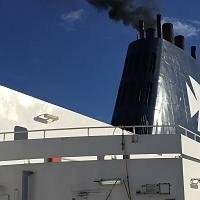 Five more days of environment polution caused by DFDS i.s.o. do their repair/maintenance on a near by dock (Amsterdam? or Rotterdam?) like Stena Line does. Just been told that "DFDS have no plans to extend the new livery to the Amsterdam ships at this time" I think they are planning new investment. So new livery or not? Thanks for the info. It looks like the new look is being rolled out over a two year period then. On that basis perhaps we can expect the Pearl to get the new look and perhaps one or two of the Dunkirk ships but we will have to wait another year for the rest? Has anyone seen if yellow ships still sail from Newhaven? According to MarineTraffic DFDS Princess Seaways is still at Gdansk. From thursday 18th she is scheduled tot sail IJmuiden - Newcastle, so she must leave Gdansk within shorter than a day, to be on time for embarking thurdsday at about 15:00 hours. She has just cleared Gdansk and is due to arrive Ijmuiden Thursday morning. She'll need to get a hurry on though. DFDS Princess (grand mother) Seaways now sails north of the Dutch islands. I.s.o. some years ago she had a delay because a fire in the funnel. This time she is expected on time at IJmuiden port, on thursday morning. DFDS are to lengthen another one of the flower class ships starting on July 1st and ending in August. Primula Seaways will be split in half with a newly built section placed in the middle of the vessel. She will be 30m longer. I assume while in Bremerhaven, she will receive the new livery. It seems work for the new section has already begun. I have a bad feeling, as with many other members, that DFDS will, as they have with other routes, run the 2 sister vessels down and eventually close the route probably within the next 5/6 years sadly. The route then my continue as a freight service. This would be a huge shame because it is a fantastic route. DFDS's IJmuiden route carries nearly 680,000 passengers a year, 10% of these in August alone. The route is very popular with Germans heading to the UK. The passage is very popular and very lucrative for the group. Perhaps the Germans might like a route from, say, Cuxhaven or Hamburg? Oh no, sorry, silly me, stupid idea! Let's hope the route is lucrative enough for DFDS to invest in it then, because they now have no other north sea routes left to close! Ryan if the country I'm taking our motorhome to is known to be expensive I'm going to look for the most cost effective way to get there... Harwich to Esbjerg cost over £1200 2 years ago, Harwich to the Hook of Holland plus a campsite in northern Germany is less the £500 even at today's prices. It may have taken an extra day of relaxed driving but I think for £700 in my pocket it was worth it. DFDS were never an option for us. It's a shame, considering how competitive Stena are across all of their routes, I don't think currency can be blamed. I think it's also interesting to see that DFDS have no passenger links with Sweden, they can cross the channel but not the Kattegat or Oresund? Yes I understand your point exactly and I would probably do the same if I were in your position, especially now I have tried the current Stena Line offering from Harwich. I was more getting at the fact that DFDS have done nothing but close or run-down passenger routes on the North Sea for years now and so far we have not seen anything to suggest that they are thinking long-term about the Newcastle-Ijmuiden, beyond extracting as much revenue as possible out of it. The Harwich-Esbjerg route may well have been over-priced etc but it still had plenty of passengers originating on both sides of the North Sea who used the route every year and more importantly there was year-round freight traffic to underpin this...yet the route still closed. As I understand it the Dutch route is much more heavily dependent upon passenger traffic, particularly mini-cruises and short breaks and this would lead one to conclude that it is probably vulnerable, again given the operator's track record. I wouldn't surprised to see both of their longer passenger routes close once the ships get too old. They've got the freight market sewn up especially after buying both Maersk & Lisco and they are investing heavily in logistics. I travelled on the Sweden run a few times and it was always popular and as for Norway, 200,000 passengers a year equates to 4000 passengers a week. There's demand there so I wonder why no other carrier has taken them on? I think the problem is that DFDS has the freight market so wrapped up that no operator coming in is going to stand a chance. No matter how much passenger demand there might be, if there is not also a decent freight custom to underpin the service it is either not going to make the new operator money or is going to be too risky (in terms of coping with fluctuations in passenger traffic). Well, that explains Sweden anyway, but not, as you say Jonno, Norway, where DFDS does not corner any kind of freight market. Scandinavia needs a big player, a company or group who as Gareths says, can absorb a certain percentage of passenger fluctuation. The obvious choice would be Stena although they'd need to invest in a more traditional cruise ferry. Both Color Line & Fjord Line were successful with the Norway run, perhaps they could be again... Once Tallinks new girl is ready, Silja Europa will be available to charter? A seasonal service may be the way to go, April-October using the one ship. Norway on a Sunday afternoon then Sweden on the wednesday night... I'd buy a ticket for both and make a week of it. Trust me, no one would be happier than me to see any kind of passenger ferry link with Scandinavia reinstated. They will be built in Flensburg and due for delivery in May and September respectivley.